Model: VW BEETLE (TYPE 1). Problems are usually misunderstandings and with a little patience can be easily resolved. Local pickup options are also available. Part number -3C8937049E / 28143246. Model -PASSAT B6. We always respond! Any problem could be resolved with our support team, we always will do our best that both sides would be happy. If you are satisfied with your item positive would be appreciated! Model: JETTA EXCEPT GLI. Problems are usually misunderstandings and with a little patience can be easily resolved. Local pickup options are also available. Model: VW TIGUAN. Problems are usually misunderstandings and with a little patience can be easily resolved. Local pickup options are also available. Part number -03G906016JN / 0261012697 / 1039S21122. Model -SHARAN. We always respond! Any problem could be resolved with our support team, we always will do our best that both sides would be happy. If you are satisfied with your item positive would be appreciated! EGT SENSOR WITH BROWN CONNECTOR,GREAT CONDITION,OFF RUNNING VW GOLF TDI. Part number -3B0927156P / 0260002669 / ZF6058006071. Model -PASSAT B5. Year of Manufacture -2000 (1997 - 2000). Any problem could be resolved with our support team, we always will do our best that both sides would be happy. We always respond! Any problem could be resolved with our support team, we always will do our best that both sides would be happy. If you are satisfied with your item positive would be appreciated! Part number -1K0907397Q / 1K0614517M / 00005305F3. Model -GOLF V. We always respond! Any problem could be resolved with our support team, we always will do our best that both sides would be happy. If you are satisfied with your item positive would be appreciated! Part number -3C0937049S / F005V00602. Model -TOURAN I. We always respond! Any problem could be resolved with our support team, we always will do our best that both sides would be happy. If you are satisfied with your item positive would be appreciated! 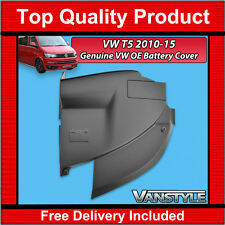 Genuine VW OE Engine Battery Cover for VW T5 Transporter & Caravelle 2010 - 2015. VW T5 Transporter & Caravelle 2010 - 2015. Genuine VW. VANSTYLE - THE UK'S LARGEST VAN ACCESSORY SPECIALIST. x Genuine VW OE Engine Battery Cover. VW Golf MK4 R32 GTI TDI Battery Cover Lid. (pictured item is the worst case). You may be able to peel it off and re stick, leave as it is or remove. VW Parts International. Includes 1x Genuine New Battery Cover Lid. The cover is made of high quality plastic, as expected of VW, and really tidies up the engine bay, concealing much of the unsightly components of the engine. 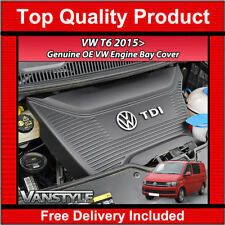 VW T6 Transporter & Caravelle 2015 Genuine Engine Cover. VAG Connectors. VW AUDI VAG - 1J0 973 714 - 8 Pin Sealed Female. 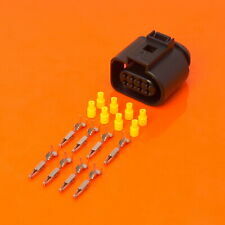 These water resistant connectors are manufactured for the VAG Group automotive market. Mate N Lok. Cable Clip. FASTIN-FASTON Connector. VW GOLF MK5 JETTA CADDY TOURAN. CADDY PREFACELIFT, TOURAN. FITTING GENUINE OEM VW GOLF MK5, JETTA. AIRBAG LIGHT RESET. MULTI FUNCTION STEERING WHEEL RETROFITTING. WITH WIPER STALK WITH ROCKER BUTTONS ON THE END. VW SCIROCCO TIGUAN 2010-2014. FITTING GENUINE OEM VW SCIROCCO TIGUAN. AIRBAG LIGHT RESET. MULTI FUNCTION STEERING WHEEL RETROFITTING. IT WILL WORK ON CARS LISTED ABOVE. OTHER SERVICE ALSO AVAILABLE. VW SCIROCCO TIGUAN 2014-2018. FITTING GENUINE OEM VW SCIROCCO TIGUAN. AIRBAG LIGHT RESET. MULTI FUNCTION STEERING WHEEL RETROFITTING. IT WILL WORK ON CARS LISTED ABOVE. OTHER SERVICE ALSO AVAILABLE. Part Number: 03C907660M. Manufacturer: VW. For year 2009 - 2013. See photo's for more information. TDI SE SPORT MK1 7L Black. 2.5 TDI - POSITIVE BATTERY TREMINAL - UNDER BONNET. This part was removed from a Right Hand Drive Vehicle. Compatibility is a guide only. Your item will need to be signed for. VW GOLF MK5 JETTA CADDY TOURAN. CADDY FACELIFT, TOURAN. GENUINE OEM VW GOLF MK6, JETTA. MULTI FUNCTION STEERING WHEEL RETROFITTING. MULTIFUNCTION STEERING WHEEL. HIGHLINE VERSION WILL WORK WITH FOLLOWING. Passengers Front In Good Condition. TDI SE SPORT MK1 7L Black. This part was removed from a Right Hand Drive Vehicle. Compatibility is a guide only. Your item will need to be signed for. Wiring Harness. Rain sensor, Touareg, Cayenne. Model: 7L 0 955 559. PORSCHE CAYENNE (955). VW Tourag (7L, 2003-2005). A new rain sensor is for sale. Needed when replacing the windshield or for retrofitting. The sensor must be replaced when replacing the windshield. TDI SE SPORT MK1 7L Black. Wiring Harness. This part was removed from a Right Hand Drive Vehicle. Compatibility is a guide only. Your item will need to be signed for. TRIM LEVEL. Volkswagen Crafter 2011 To 2017 Other. Item Specifics:2014-2017 - MK5 - 5 DOOR - HATCHBACK - STRAP BATTERY LEADS - PART NO 6C0971349 - 6C0971349. POLO 2016 -2017 Mk5 (6C). Would like you to know that we will do all we can to rectify any problems. NOT HAPPY?. - let us know so we can fix it. We have a wide range of vehicles and parts on site. We are based in Northern Ireland in Co Armagh. VW Touareg III CR7 (4/5-door / left-hand drive). from 8:00 16:00. We are here for you! Color Deep Black LC9X. Mileage 73.540 KM. OE numbers were the item has/can been applied on: L5F30818P03 L5F30818P04 Brand VW Manufacturer Part Number AW-TCP-009 Warranty 6 Month Country/Region of Manufacture Japen UPC Does not apply. GenuineVAG Group part. Part number:8E0972415.